The hard rock and metal boom of the eighties left a lasting impression on millions of teenagers. Among them, two young guys in Turku, Finland got an extremely bad case of hard rock poisoning. In 1986 it got really bad, and they decided to form their first band. 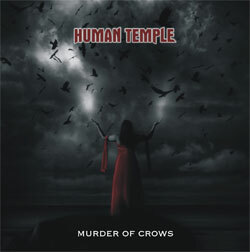 Those guys were vocalist Janne Hurme and drummer Petri Lehto (right), and that band, whatever it was called, lead them to a road of no return...and ultimately to HUMAN TEMPLE. During the late eighties and early nineties Janne and Petri played in various bands with many of the rock musicians of the Turku area, including current members of bands such as Kilpi, Clayskin and Rock City Band. In 1995 things changed dramatically, as Hurme was given an opportunity to sing entirely different kind of music in 1995. He took the chance and went on to become one of the most popular pop/"schlager" artists in the country, but he never lost his passion for metal and hard rock. There was always a hard rock band waiting in the wings...and Janne kept on writing hard rock songs. 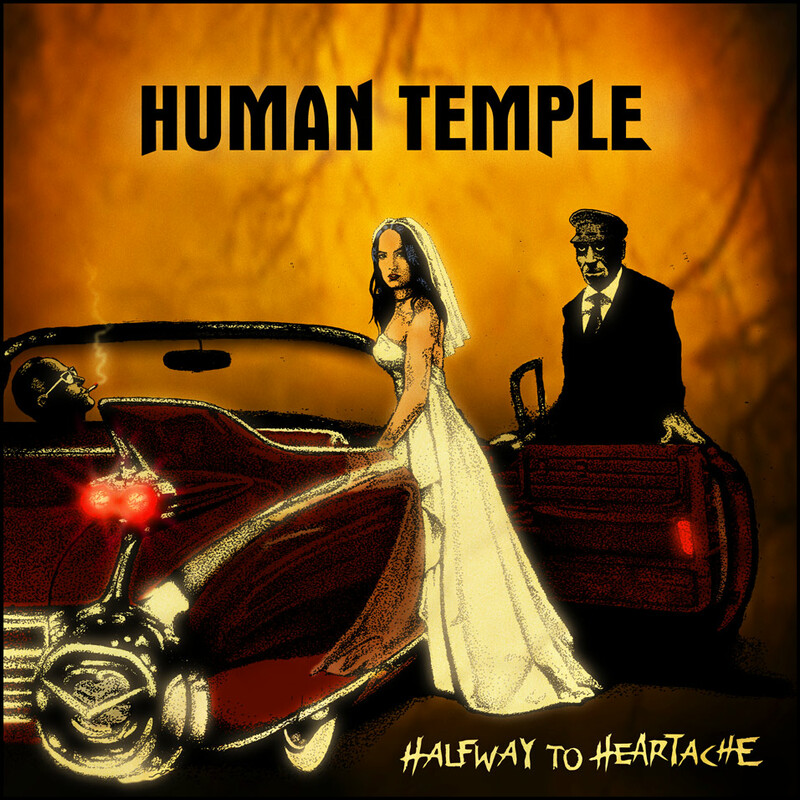 Human Temple was formed in 1998. The line-up was Janne "Brother Cane" Hurme - vocals, EQ Saint - bass (pictured left with Janne) , Petri "Hellhammer" Lehto - drums and Petri Kitti - guitars. The line-up wasn?t too stable, with several guitarists and keyboard players coming and going. However, it was this line up that played on the first demo "Walk Between The Shadows", recorded in the fall of 2001. During 2002 the demo found its? way to a few magazines, websites and record labels. 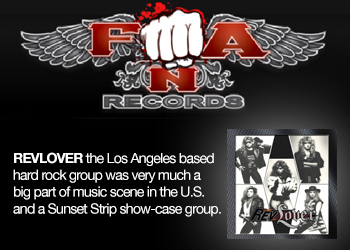 The response was very encouraging, not only from the press and labels, but also from the music fans. The three tracks from the demo were released as free downloads on the band?s website, and the traffic on the site went through the roof. A few months later a new song "On A Night Like This" was added to the site, and it became instantly the most downloaded track of them all. Curiously enough, the song was also released with Finnish lyrics and a slightly different arrangement as a Janne Hurme solo single. 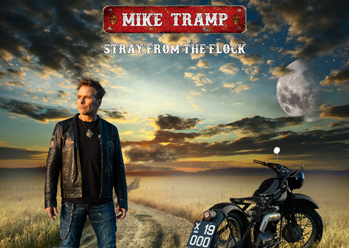 Although the song is clearly a melodic hard rock track, it still gained airplay especially on the smaller radio stations who tend to play more "schlager"-type of material. In early 2003 the band had stabilized to a quartet, with guitarist Jari Salo and bassist Harri Kinnunen completing the line-up. Right there and then the band decided that it was time for the first album. The recordings were kicked off in the spring, and the final touches were made in December. Guitarist Jari Salo handled the production duties, as he?s been doing studio work for years. His quest for the perfect sounds earned him the nickname of "Mutt"...Jari also took care of the keyboard parts and sang a lot of the background vocals. Just to add a little extra flavour to the album, a few guests were invited to take part: three Finnish top lead guitarists, Emppu Vuorinen from Nightwish, Jani Liimatainen from Sonata Arctica and Erkka Korhonen from Urban Tale added their solos to one song each. One of the best metal shouters of the country, Taage Laiho of Altaria/Kilpi fame provided backing vocals. Keyboard player Tony Green joined the band in late 2003, unfortunately too late to be featured on the album. Finally, in February 2004 the album was mastered by Mika Jussila at the world-famous Finnvox studio. 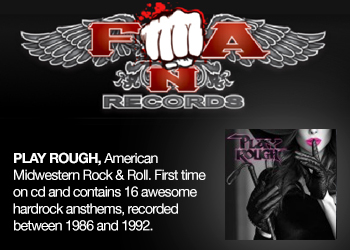 In March 2004 the band signed a deal with MTM, one of the leading hard rock labels in Europe. 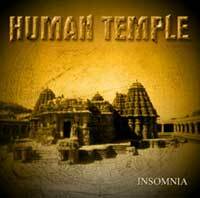 The label released the album "Insomnia" in June/July, 2004, and it recieved rave reviews from magazines and websites all over the world. 2005 wasn?t too active time for the band. Early this year, keyboard player Tony Green left the band to concentrate on family life and his own musical activies, only to be followed by Jari Salo, who went on to become a solo artist. He?s been involved with the "Aurinkotytt? "-model contest tour, providing the musical entertainment with his band Sessio, and has released a single tied to the theme. The band replaced Green with keyboard player Jori "Jorge" Tojander during the summer of 2005, and guitarist Juha Lepp?nen stepped in shortly afterwards. However, his stay in the band proved to be quite short, and he has since left the group. In July 2006 the band announced that Pertti "Pertza" Renko is the bands? new guitar player.